If this is what’s going on in Canada—where being polite is as much a way of life as being rude is here—following Trump’s big win, expect to see a lot more public disturbance calls. It’s nice that people are hoping that cooler heads prevail and calling for national unity. If you believe either of things is likely, feel free to refer to yourself as an eternal optomist. At any rate, this Toronto tough guy is so lame, he’s almost cute. Freelance writer Valeska Griffiths was on the St. Clair Avenue streetcar in Toronto when she encountered a racist that left the whole car horrified. 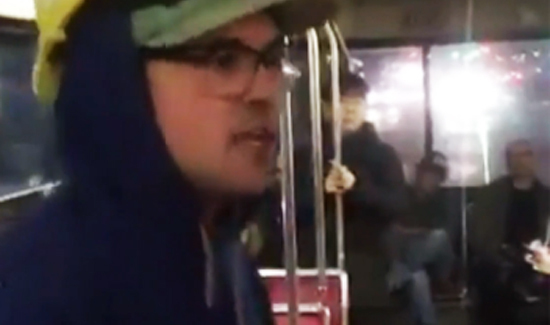 On the video she captured, a man in a blue hoodie and hard hat is being held back from a dark-skinned victim. The man claims he was punched in the face, though no one witnessed the incident, CBC reported. “You’re a little b*tch, eh? Welcome to Canada,” he yells back. If you click through and read the actual article, you will see that NO PUNCHES WERE THROWN. This was a shoving match between two men. No charges were made and both were allowed to remain on the streetcar. In fact, there is evidence that the Trump supporter was shoved first, based on his statement to police. Please do not post race-baiting click bait stories like this. There are enough incendiary articles in the press without adding to them in this fine law-enforcement publication. Thank you kindly for reading my comment. The current bout of violent racism was started by BLM, supported by Obama and Clinton. That is not tolerable. Neither is reciprocating it.